​Looking for a FREE Bear Paw quilt pattern? Check out these simple instructions. Also, I'm a total sucker for children's books about quilts. Isn't this one cute? Quilters have scraps. If you’ve made a few quilts, you know what I’m talking about. Because quiltmaking often requires fabric of all different shapes and sizes, quilters are usually left with a lot of random, unused fabric. Unused, yes. But not unusable. Enter: The Bear Paw. Grrrrr. 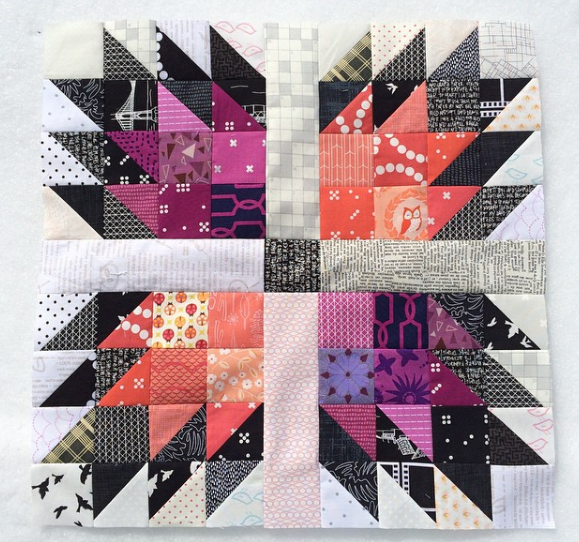 This design will swoop in and make use of all those tiny scraps you have laying around – even the little half-squares! The Bear Paw Quilt Block: Saving Lives Since 1850​. Yes, you heard me right. The Bear Paw Quilt isn’t just a pretty pattern. It actually helped save real people’s lives. One of the most popular theories about the origins of the Bear Paw quilt pattern is that the quilt block was used to guide escaped slaves to food and water in the days of the underground railroad. Whether you call it the Tea Leaf Design or the Illinois Turkey Track (yeah, that’s real), the Bear Claw quilt is a really good one, especially if you want to get scrappy. Let’s dive in! 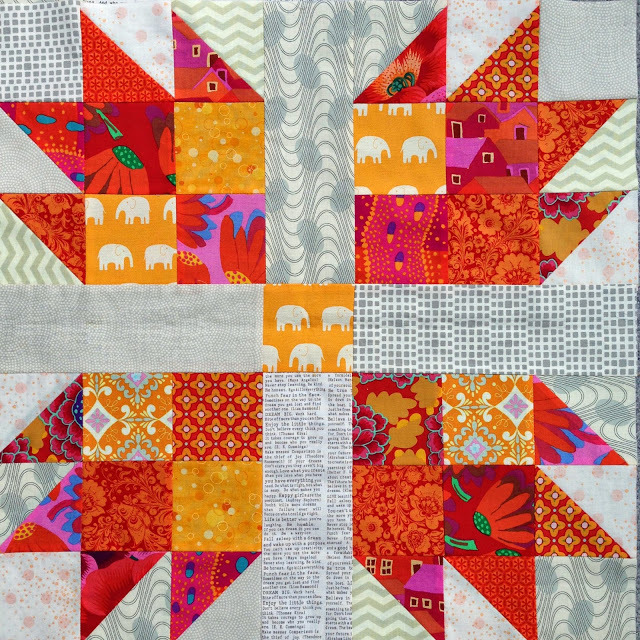 The Bear Claw Quilt Pattern Uses ALL the Scraps​! So, as you can see in some of the example pics later on in this post, a classic Bear Claw block is made up of four “claws,” either all facing out, or in the same direction around a single square in the center. The bear claws themselves are made from one large square, and four half-square triangles. Here are some of my favorite variations and color schemes. Aren’t they gorgeous?​? I have loved this quilt since January when the Big Bear Cabin made its stunning debut. 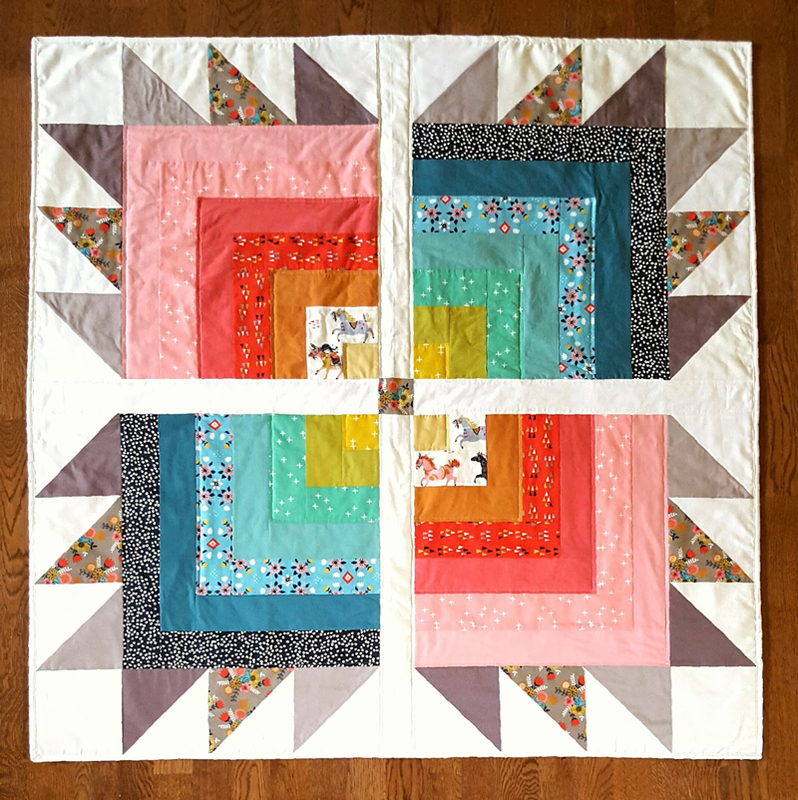 There are so many things I want to say about this quilt, I need to take a minute to collect my thoughts so hopefully I am able to do it justice. A minimal, modern quilt created through traditional block inspiration. Combining two (the Log Cabin block and the Bear Claw block) traditional blocks into a new contemporary design. BIG! Four blocks + sashing make up the entirety of this quilt. This allows for a striking and bold composition. The ability to use multiple bright colors in a way that doesn't SMACK of RAINBOW – each color family is grouped in such a way that allows the design to maintain it's minimal composition with color adding to it rather than detracting from it. And 5, just because I can't help myself – the seamless use of pattern and solid fabrics. The balance of the two compliment each other so well, allowing the viewer to see both the color and the pattern vividly. ​In a nutshell, one of my favorite quilts of 2016. The Bear Paw block above is the perfect example of how to make a scrappy block, while still maintaining a defined color palette. Sometimes it's hard to rein in the scrap excitement once you find a design that works well for those little bits plaguing the small corners of your sewing room. However, if you use various prints, I highly recommend sticking with a limited color palette. This will help those little patterns​ play nicely with each other. This block is doing all the things right – scrappiness, limited color palette (pink, purple, black and white)​ AND bear claws inside bear paws! majorly cool, right?? ​So talk to me. How do you like to bust through those piles of scraps? Have you made a bear paw/claw/duck foot/tea leaf quilt? I recently made 2 quilts with bear paws. First, one from a Frivols kit. Then I liked that so much I made one with some sampler blocks — http://carolquiltssometimes.blogspot.com/2016_09_01_archive.html. 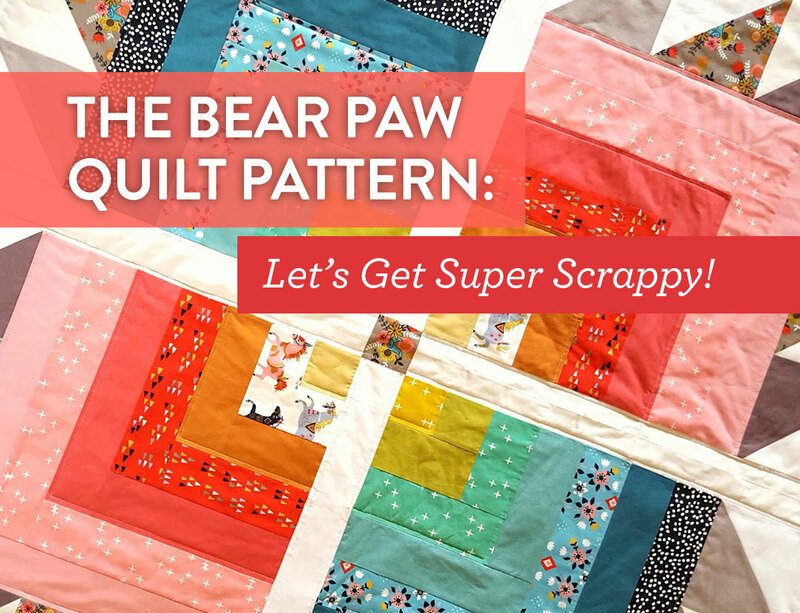 Now you’re making me want to make another — I really love that scrappy log cabin/bear claw by Fabric Mutt! WOW!!! Your bear paw quilt is STUNNING! I’m seriously speechless! Well done!! I love this block. My take on this for a Rotty named Teddy. You might like to see it. WOW!!! I am making my mini quilt tomorrow and am so going to use your pattern. Thank you so much.